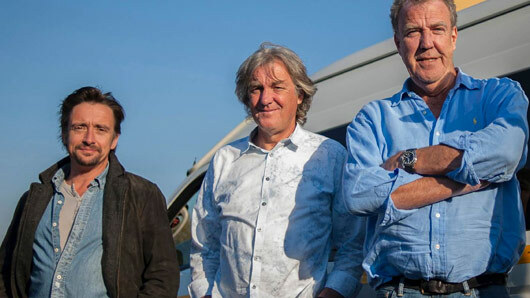 The second season of The Grand Tour may be postponed following Richard Hammond’s car crash in Switzerland last weekend, according to Jeremy Clarkson. Hammond was airlifted to hospital on Saturday (June 10) after losing control of a Rimac Concept One electric car. The star had been taking part in the famous Hemberg time trial while filming for the Amazon series in Switzerland, with his co-stars Jeremy Clarkson and James May. The accident caused the vehicle to go up in flames and left the host with a fractured knee. Many fans have wondered whether the Amazon series will be delayed as a result, and now co-host Jeremy has addressed concerns in a post on DriveTribe. Clarkson continued: “I’ve been up since dawn, rewriting all of the scripts and ideas we had to accommodate the fact that Hammond can’t drive for the next few months. “Meanwhile, he is lying in a bed in the Swiss Alps, while pretty nurses attend to give his every need, and give him drugs. A spokesperson for The Grand Tour said in an official statement: “Richard was conscious and talking, and climbed out of the car himself before the vehicle burst into flames. “He was flown by air ambulance to hospital in St Gallen to be checked over – revealing a fracture to his knee.